Acrew’s favorite pirate saying is “Up for luck!” which he described as coming from raising the sails. “It’s an Irish folklore saying that is like ‘thumbs up!’” he said. Clay Clement, owner of Studio City Tattoo, Los Angeles’ favorite destination for skin art, has embarked on a new adventure. Clement’s award winning tattoo shop is already known for celebrity clients highlighted by Pat Benatar, Miley and Billy Ray Cyrus, Will I am (Black Eyed Peas), Kirstie Alley (Dancing with the Stars), Cher, Tommy Lee, Slash and Lenny Kravits to mention a few. But today, Studio City’s own “gentle giant” returns to the spotlight as an author of a children’s book inspired by his desire to dedicate a “pirate themed” Christmas tale to his two children. 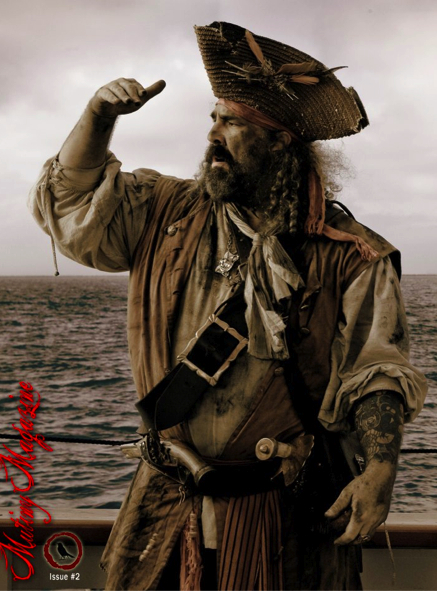 Acrew himself is known in the worldwide pirate community – yes, there is one – as the founder of the online “Mutiny Magazine” and the exclusive Order of the Leviathan, to which membership is nominated and voted every other year in recognition of community service and contributions to the pirate community. With this year’s induction, including the Bay Area’s pirate entertainer, Captain Jack Spareribs, only about 50 have made the cut.